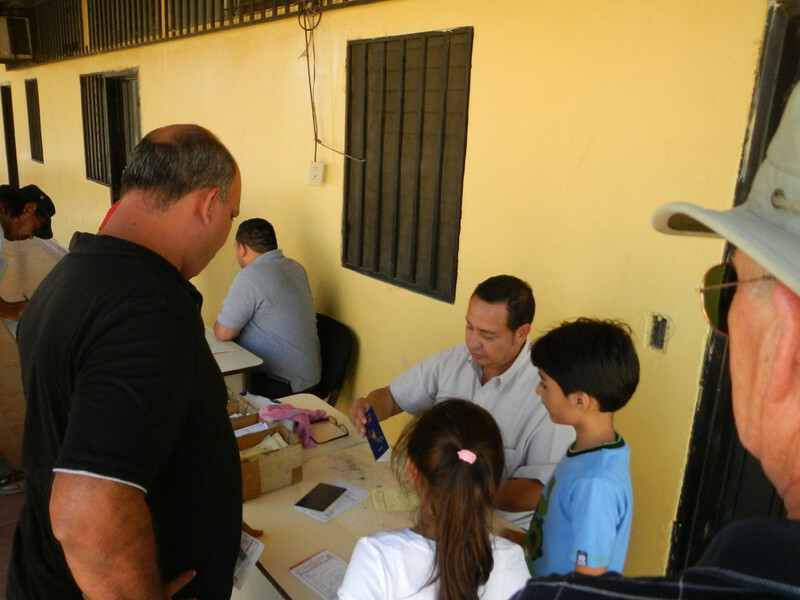 Another border crossing today after a short ride from our hotel in Choluteca Honduras. 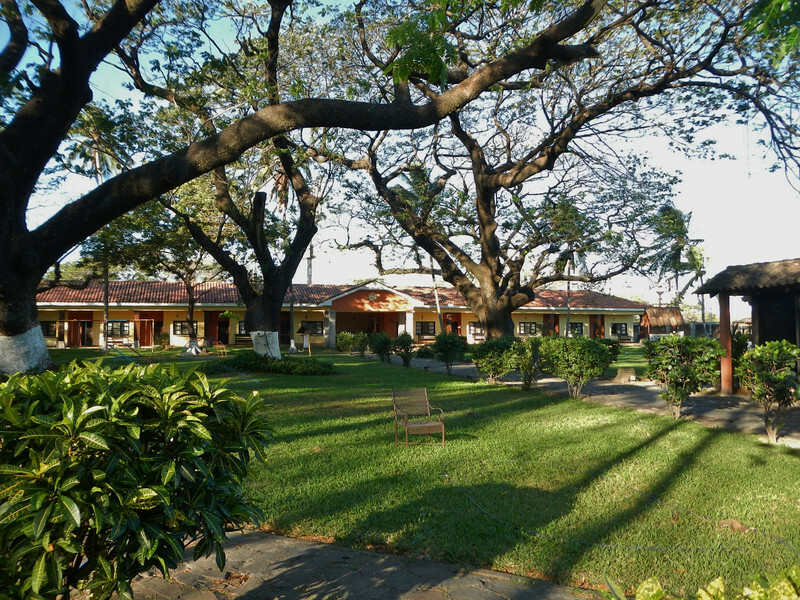 We were in a pretty nice place that was recommended called the Hacienda Gauliqueme. $80 USD included a full breakfast. After a HOT day riding we ended up directly in the pool. The goal for today was Leon, Nicaragua, a short 116 mile run but it included a border crossing so we decided to leave at 9:30 to leave plenty of time. The road, CA-3 was full of huge pot hole craters, all of the cars and trucks looked like they were being driven by drunkards as they swerved from side to side on the road. I passed one semi on the right because he thought there were fewer pot holes in the oncoming traffic side of the road. The danger, of course, is that he could swerve at any moment back to the right as I was passing. Strangely enough, this all seemed perfectly normal. Deby and I did pretty good avoiding the craters when BAM I hit one hard enough that I thought I should pull over and check my front wheel. Since it was nearly 100 degrees I spotted a tree and headed for it. As I got closer I saw some kids were standing there with something in their arms. I took a few pictures. 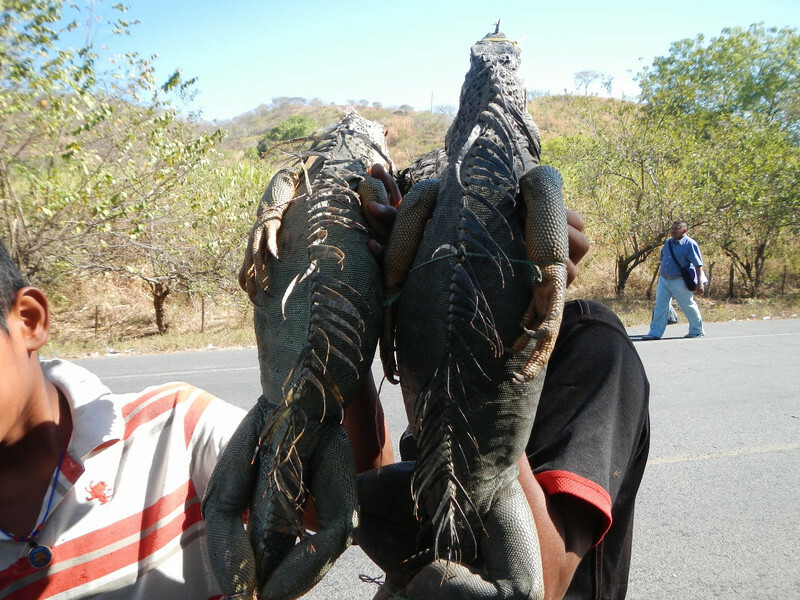 Huge Iguanas! What is that about? They were very proud of them and loved showing them off but I couldn’t figure what they were doing with them. Planning on selling them? Eating them? Who knows? 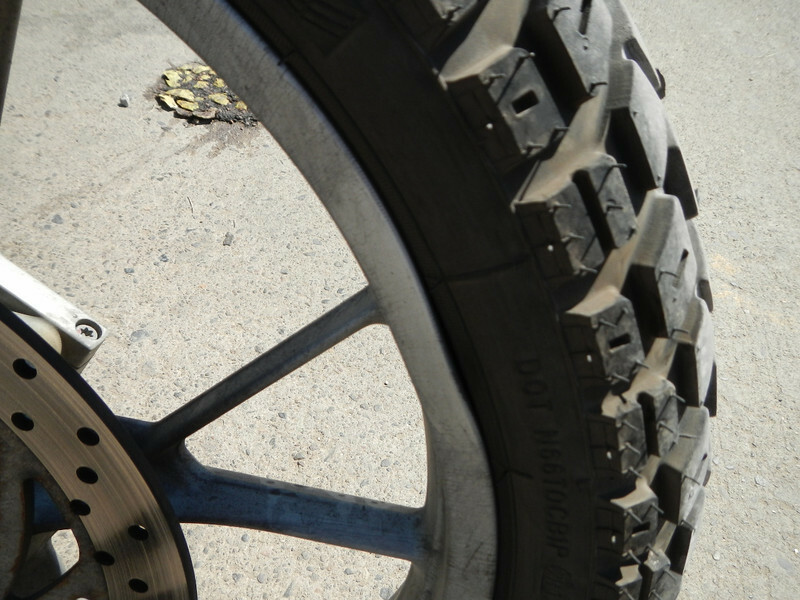 Thanks to my reinforced Excel rim from Woody’s Wheel Works my rim and most of the bike seemed to be intact. When we got to the border I took inventory of all our rims, Dave’s didn’t fare as well. Hmmm, probably OK for now but we’ll have to keep an eye on it. The border crossing was slightly easier today and we were through in only about 2 hours. 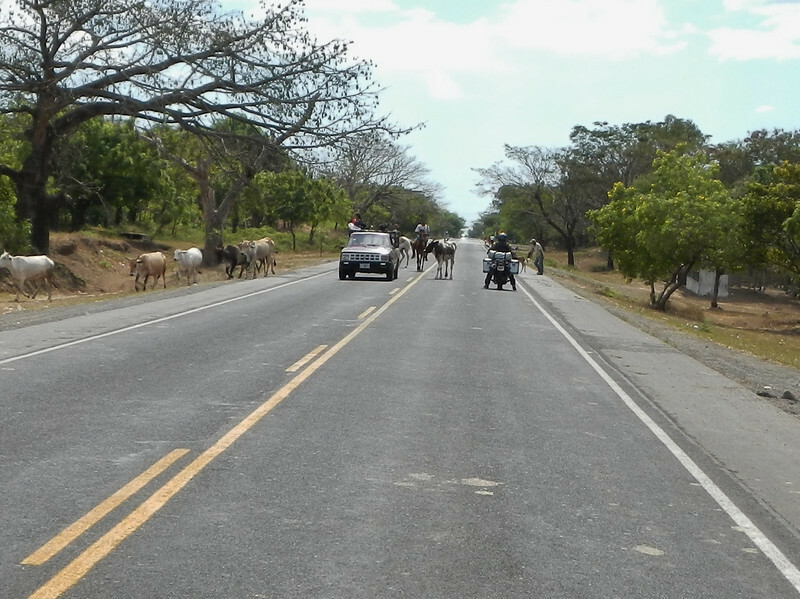 This crossing is off the PanAmerican Highway so I think it was a little lower key. I took a couple of pictures. At the first stop to get our exit stamp a crowd forms around the bikes as usual. Passports were processed at a folding table out on the deck, nothing formal here. 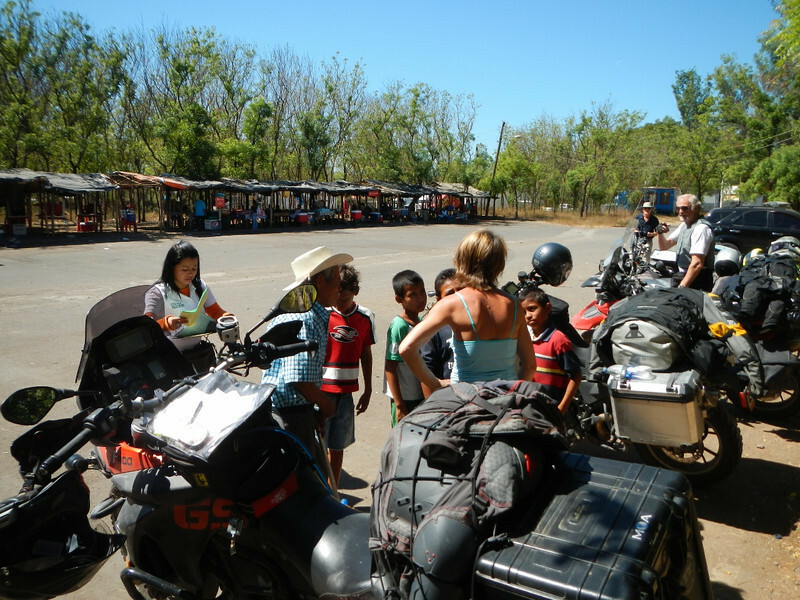 At the second stop to import the bikes Deby was surrounded by kids amazed by the great white gringo woman moto bike rider. 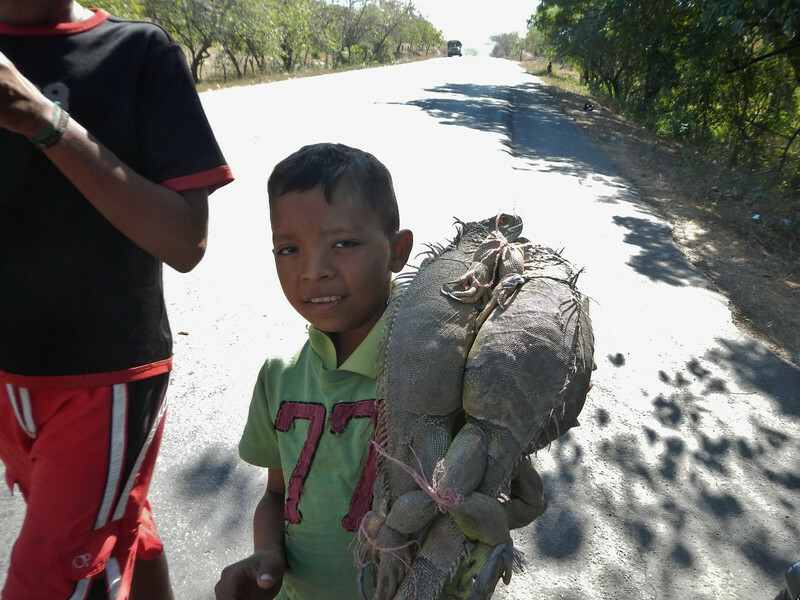 In Nicaragua the road improved enough that I took out my camera for a few drive by pictures. 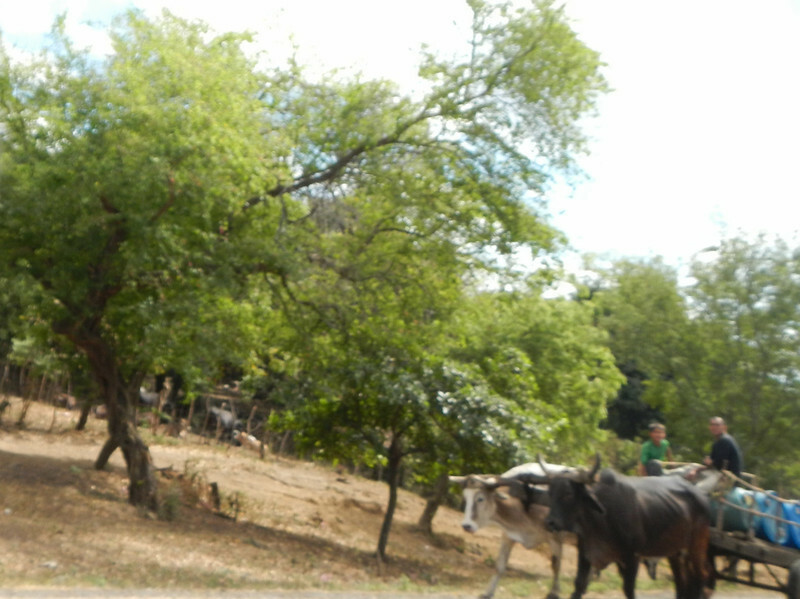 This little kid was driving his herd all by himself, when he saw us he gave me a big wave. 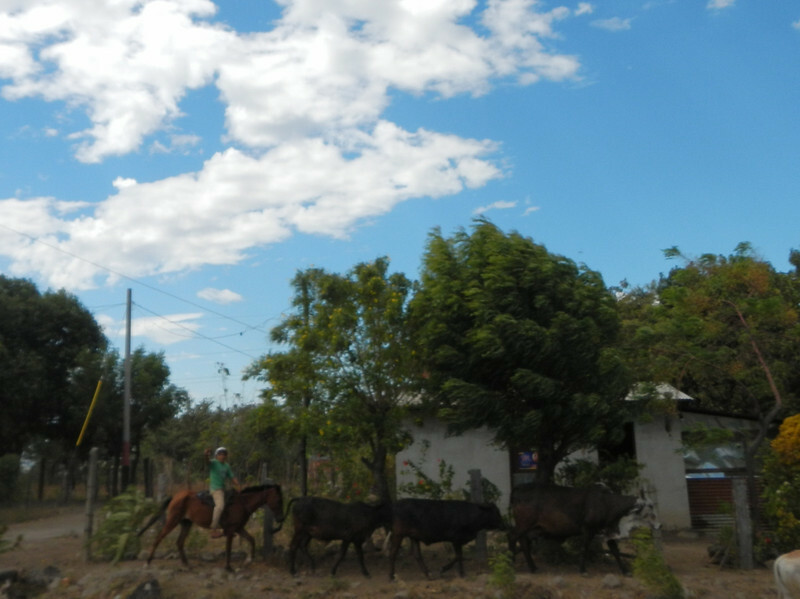 Sorry about the crummy pictures, it’s hard to aim the camera while riding with one hand, dodging pot holes, watching for cattle, dogs, chickens, cars, trucks, bicycles, motor scooters, kids and, more often in Nicaragua, horse and ox drawn carts. All this is perfectly normal to us now. We got to Leon in the early afternoon and somehow we all managed to get split up. Deby, Michael and I were together and Dave was on his own and Keith and Jim were somewhere looking for Dave. The three of us were stopped at a hotel and Deby saw Dave ride past a side street, she ran full speed after him in her riding boots and caught him a few blocks away. Next Michael and I went to look for Keith and Jim and found them a few km’s south of the main part of town. By 4:00 we were settled in the Best Western Hotel and had time to get to a nearby bar to watch the kickoff of the Superbowl. My GPS records a detailed track of my path. 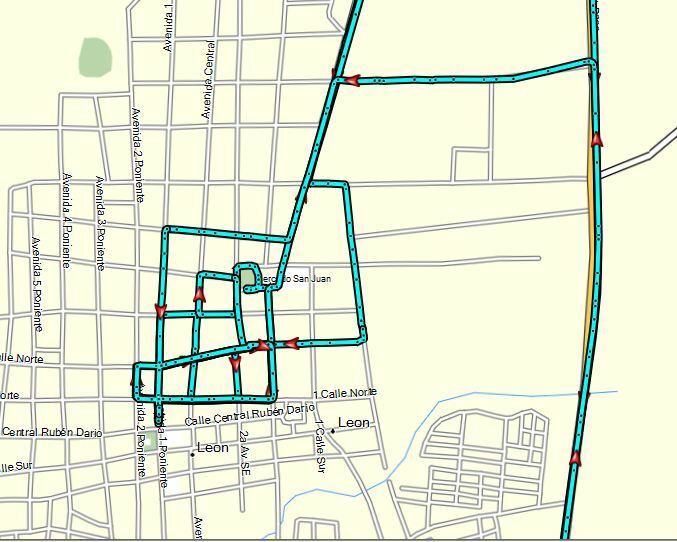 Here is my tour of Leon while looking for the hotel and lost riders. What the track doesn’t show is how many times I circled those blocks. Keep in mind, it was killer hot and this is a crazy busy city with narrow one way streets packed with traffic, people, bikes…. and well, you get it. After dinner Deby and I skipped part of the Superbowl (we missed the power outage) and went for a walkabout around town. There must have been some kind of festival because there were bands on playing on the streets, people were everywhere, booths and vendors were selling in full swing. It was a hot night of people, music, food, traffic and general craziness every where – we loved it. I only wish I would have brought my camera. Tomorrow we are going to have a short day riding to Granada and hope to meet up with our friends Tad and Gaila who are on a 1 year motorcycle journey. You can read their blog HERE. 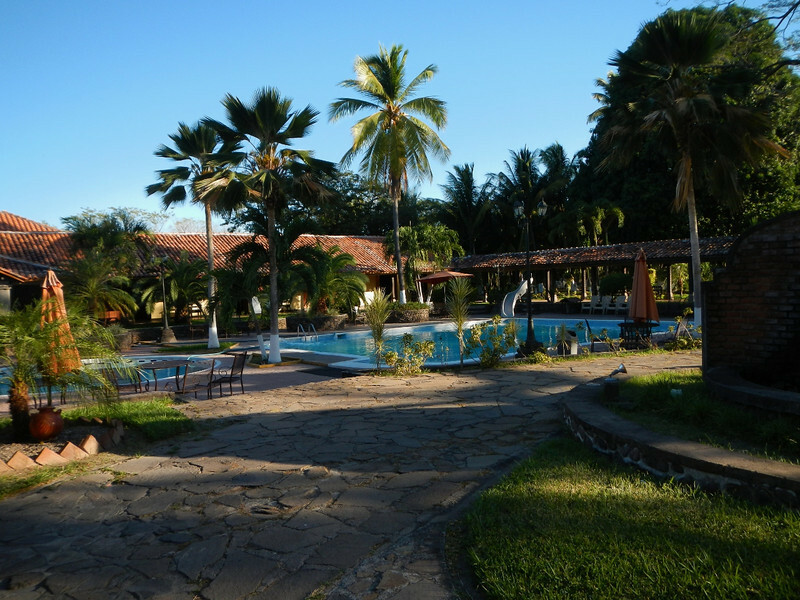 You can see more pictures of Nicaragua HERE, and don’t forget you can track our progress real time on SpotWalla HERE. Thanks for following and we love the comments. 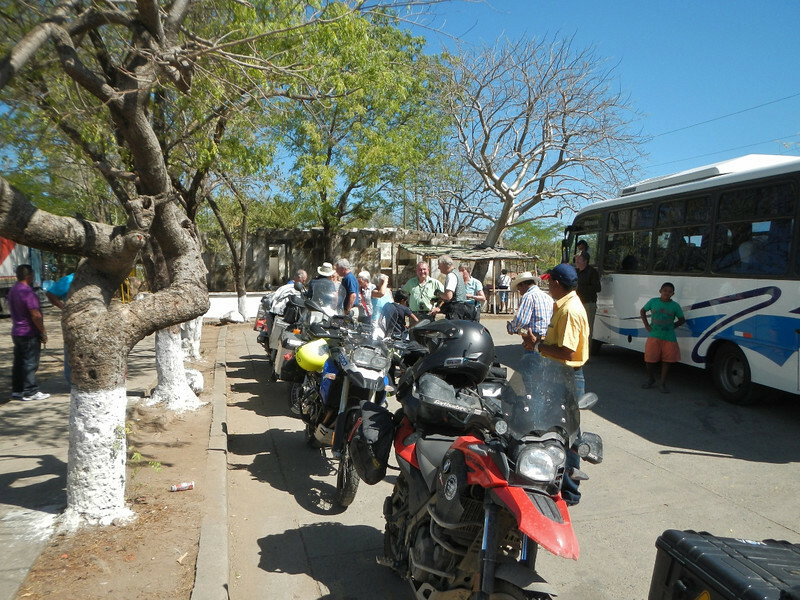 This entry was posted in 2013 Motoraid II, 2013 Nicaragua, Motorcycle Adventure by donnh. Bookmark the permalink. Enjoying your posts. Following your track in a few weeks. Hi, best of luck. It will be fun. With all of the border crossings you’ve done so far, I wonder if there has been any “palm greasing” required, or is it all legit? Seems like this part of world has had a reputation for ways to ease government bureaucracy. Every time I start to sympathize with your time at the borders and the heat, you post pictures of the hotels and beaches and I don’t feel bad for you, I feel bad for me. Amazing trip! Amazingly, the answer is no. There are big signs everywhere that say the services are free. The key is to avoid the “fixers” that charge for their services and route them to the most expensive photocopy places to get a kickback. With decent Spanish speaking skills we’ve found those guys are not necessary. One place had a required “tip” for the official, it was $2.00 and we had to buy it at an official window…. that was strange. I can see from your spotwalla you are about to enter Costa Rica. Can’t wait to catch up with you there in your next blog!